The future of the Walking Dead Universe could be mostly zombie-less, creator Robert Kirkman teased in the "Letter Hacks" column ending March's The Walking Dead # 186. 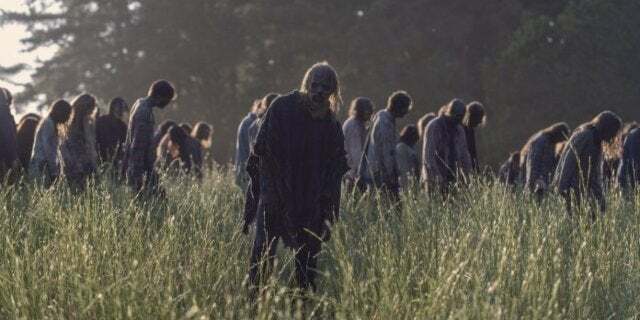 "That's probably generations away, but entirely feasible, sure, once all the muscle tissue and flesh holding those meat bags together fails," editor Sean Mackiewicz when asked for walkers will ever be too rotted to move or bite. Using a ratio supplied by Kirkman in issue # 10 of the comics – that the ratio of walkers to humans is 5,000 to one – SourceFedNERD 's Matt Lieberman in 2016 estimated just 0.0002% Of the world's population, or 1.4 million people, were still alive after the initial outbreak went global. Lieberman then number that diminished and fell below half a million in the first 600+ days of the outbreak, leaving less than 400,000 survivors across the globe. The Walking Dead next releases issue # 190 Wednesday, April 3. The Walking Dead Season Nine premieres new episodes Sundays at 9 / 8c on AMC.